Meet Nisha Gupta, director of the LGBTQ-advocacy short film “Illuminate,” a 20-minute cinematic poem about being in the closet as a sexual minority. Not only is Nisha is the founder of the Phenomenological Film Collective, a filmmaking group that produces short films about lived experiences of oppression to promote compassion, solidarity, and hope, she also holds a clinical psychology PhD at Duquesne University who integrates liberation psychology, phenomenological research, and the media arts to create therapeutic interventions for personal and sociocultural healing. illuminate: a cinematic poem about being in the closet from Phenomenological Film Collective on Vimeo. AWI: What was your most meaningful takeaway from making the project? And/or what was your most meaningful takeaway from your dissertation overall? Nisha: While making this short film about the trauma of the LGBTQ closet, I became fascinated by the role of beauty in trauma-healing as both a filmmaker and psychologist. Psychologist Pierro Ferruci said, “Beauty is the affirmation of life.” In times of despair, we hunger for glimmers of beauty to hold onto hope and affirm life. So while making the film “illuminate,” creating aesthetically beautiful cinematography became the guiding force of the project. I wanted the film’s cinematography to communicate to viewers—particularly closeted LGBTQ viewers—that amidst the closet’s despair, tiny glimmers of beauty, light, and hope still exist and are worth searching for. I wanted this film to demonstrate that these glimmers of beauty, within the closet’s walls, can serve as windows to solace and liberation—and perhaps to eventually coming out. As a psychologist, making this film made me realize that shining a light on beauty is essential to helping traumatized people make their way out of despair—a significant insight for the LGBTQ community due to its high suicide rates. Maybe that’s why art is so effective for trauma-healing: it returns us to beauty and hope amidst the depths of our suffering. AWI: What were the first few steps you took to planning / mapping out your approach to the topic? What steps did you take (if applicable) to learning more about mental health and trauma broadly, and especially the intersection of trauma and LGBTQ mental health. AWI: How can you ensure you are being genuine and using storytelling effectively in a short film? AWI: We LOVE your website – can you walk us through some of the sections there? Nisha: Thanks! 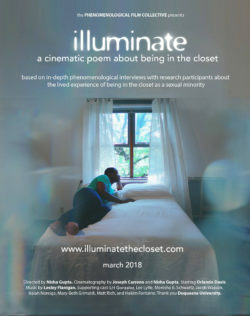 On www.illuminatethecloset.com, you can not only view the 20-minute short film “illuminate,” but also read information that intertwines psychology with human rights law. The website explains how the film “illuminate” poses a political argument: that the LGBTQ closet entails a traumatic loss of existential rights—the right to truth, freedom, love, hope and power. The website extensively outlines the mental health impact of these human rights losses upon the LGBTQ community. It also suggests ways that citizens of society can band together in solidarity to re-gain access to these existential rights. Finally, it provides a list of LGBTQ mental health and political advocacy resources. AWI: What are some (low cost, accessible) resources that have been helpful to you as an emerging filmmaker? Nisha: Alongside completing my Ph.D. in clinical psychology at Duquesne University in Pittsburgh, I took filmmaking classes at Pittsburgh Filmmakers, which I found to be an invaluable resource to getting my feet wet as a novice filmmaker. Also, Youtube is a godsend. AWI: Do you hope to continue to incorporate the arts as a form of expression, healing and research in your career and studies moving forward? If so, why do you think this intersection of world’s is so critical? Nisha: Absolutely. Most of my work as a psychologist focuses on the psychological impact of socio-political oppression upon members of marginalized communities. I believe it is essential to share these psychological experiences with the public, in order to foster compassion and solidarity and spur social change. Art is an amazing vehicle to evoke compassion—particularly films. I see my career as a psychologist to be one in which I will continue producing social advocacy films that express the emotional pain of marginalized experiences, in order to do my part as a citizen in shaping a more loving society. Be sure to check out the film’s website and follow along Nisha’s progress – she is sure to make waves in the intersection of mental health and film 🙂 Starting in Fall 2018, she will join the faculty of University of West Georgia’s Psychology Department as a tenure-track assistant professor of psychology.